Zveno (Russian: Звено, Chain link or a military unit "Flight") was a parasite aircraft concept developed in the Soviet Union during the 1930s. It consisted of a Tupolev TB-1 or a Tupolev TB-3 heavy bomber acting as a mothership for between two and five fighters. Depending on the Zveno variant, the fighters either launched with the mothership or docked in flight, and they could refuel from the bomber. The definitive Zveno-SPB using a TB-3 and two Polikarpov I-16s, each armed with two 250 kg (550 lb) bombs, was used operationally with good results against strategic targets in Romania during the opening stages of the German-Soviet War. The same squadron afterwards also carried out a tactical attack against a bridge over the River Dnieper that had been captured by advancing German forces. Using the added thrust of parasite aircraft to get a heavily laden bomber airborne. In all Zveno configurations, all aircraft were piloted and all had their engines running — it was expected that the combined thrust would more than offset the weight and actually improve the performance of the mothership compared to conventional bombers. The fighters were rigidly attached via pyramid-shaped metal frames, with both latches controlled by the fighter pilots. (On Zveno-1, the front latches were controlled by the bomber crew, while the back latch was controlled by the pilot; this was changed to all-pilot control in the next version). The original design included umbilical fuel lines which permitted the fighters to use fuel from the bomber while attached, although this was not fully implemented in practice. Zveno-2 Tupolev TB-3 and three I-5, the third aircraft was attached over the fuselage. First flight August 1934. The TB-3 was piloted by Zalevskiy, the I-5s were piloted by Altynov, Suprun, and Suzi. 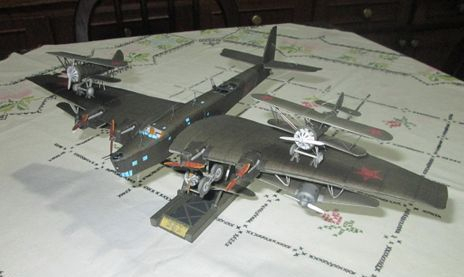 Zveno-3 TB-3 and two Grigorovich I-Z under the wings. Zveno-5 TB-3 and a single I-Z under the fuselage which attached and detached in the air as there was not enough ground clearance for the fighter. On 23 March 1935, TB-3 piloted by Stefanovskiy and I-Z with Stepanchenok at the controls performed the world's first mid-air docking between two fixed wing aircraft. Zveno-7 TB-3 and two I-16s, all docked in the air. First flight November 1939, pilots Stefanovskiy, Nyukhtikov, and Suprun. Fighters could re-attach in flight due to two retractable trapezes, one under each wing. Docking, while possible, was deemed too difficult to be practical. Aviamatka (Airborne mothership) TB-3 with two I-16s under the wings, two I-5s on top of the wings, and one I-Z attached under the fuselage in mid-air. First flight 20 November 1935. The TB-3 was piloted by Zalevskiy, the fighters piloted by Stefanovskiy, Nikashin, Altynov, Suprun, and Stepanchenok. Vakhmistrov also worked on a larger Aviamatka with eight I-16s. 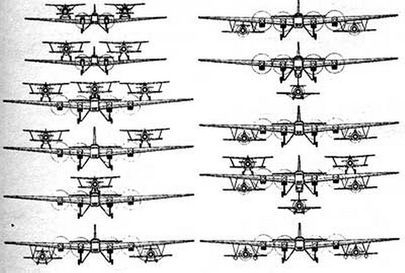 In this scheme, the TB-3 would get airborne with two I-16s under the wings and the remaining six would attach in the air. 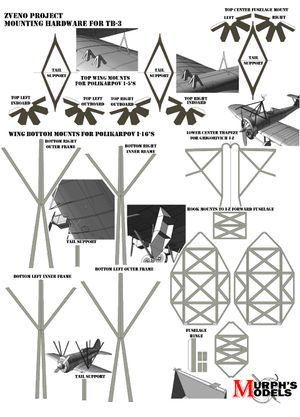 Not all eight would attach at one time, but would rotate in and out during the flight, detaching and re-attaching as needed. These six aircraft could also refuel from the mothership. Although a few successful mid-air dockings and fuel transfers were performed in 1938 (Zveno 6 and 7), the eight-fighter configuration was never completed. SPB (Sostavnoi Pikiruyuschiy Bombardirovschik - Combined Dive Bomber) TB-3-4AM-34FRN and two I-16s under the wings, each armed with a pair of 250 kg (550 lb) FAB-250 bombs. Used operationally in World War II with good success.